We’ve all heard it before. One of the “best ways to improve your photography” is to enter a print competition because of how it can help you learn, grow and see minor details you may miss without an extra set of expert eyes. Strong composition, emotional impact, and technical excellence are universal regardless of whether your specialty is portraits, landscapes or perhaps fine art photography. As judges we are looking to see it in practice and reward you on your execution. 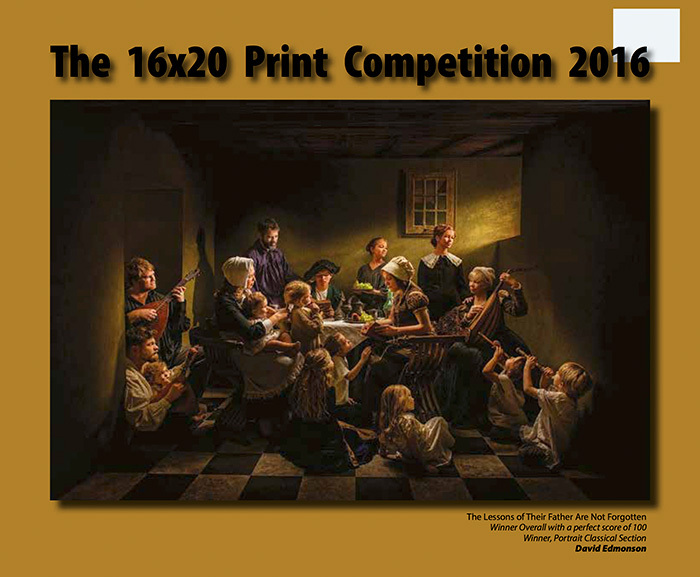 My personal belief is that there is a big difference between a print competition and a photo contest. As a professional photographer, my personal motivation in entering is to get better. A score alone provides feedback, but the value of it is limited. A competition that offers written or audio critiques brings additional value through the judges commentary. I’d strongly encourage everyone to take advantage of the optional written remarks if you are serious about being the best you can be. I’m an advocate of the approach where as judges we “award points” rather than subtract. A perfect 100 scoring print happens because it earned 100 points. An entry in the “Standard Practice” range attains the points necessary to qualify as the type of work we all should do on a daily basis but is short of an above average skill in most areas distinction. Let’s look at the NAPCP scoring criteria. There are three main areas as judges and competitors to consider. Each entry is evaluated to determine how it falls on a scale of 1 to 10 in the respective areas. Here is the scoring key definition again, to make it easy to follow. I’d like to explore these ranges and provide them some general commentary. To earn 10 points, the judge is saying that this is a benchmark or landmark image. Not only is it the best possible use of skills, creativity, and technique, it is unique. It’s the type of photo that once it’s seen people stand in awe of and it pushes everyone’s imagination forward. 9-7 points mean the entry is somewhere in the outstanding range. It is possible to score this high if you enter a concept that has been seen before and done many times. However, keep in mind that since it’s not unique, it then must be one of the best versions of that idea ever done. Where it falls within that range depends on the degree of execution in above average skill in most areas. 5-6 is often hard to digest as it means you are producing good salable work that professional photographers should provide every day. Often, it may feel like it’s not up to par but the judges are only telling you to push yourself further. Often, it’s about refining the elements you are currently using ranging from lighting, posing, emotion/expression, composition and beyond. Anything scoring 1-4 is not considered up to professional standards and requires improvement in technique. While it’s easy to become discouraged, embrace it as an opportunity to focus on your weak areas and grow them. As a judge, I’ve been fortunate to sit on panels with photographers incredibly more gifted, talented and experienced than myself. As a competitor, I’ve watched prints that I loved come up short. Over the years and throughout the process, I’ve been able to learn and grow and discover the amount of effort required to take something from ordinary to extraordinary. I’ve also watched photographers marginalize the judges by saying that “they are hard,” “they don’t get or like me,” or myriad other excuses. In 2016, my father David Edmonson scored a perfect 100 on a print he entered in an overseas competition. It didn’t start out that way, although he had an excellent initial score the first time it was judged. For those who may not have had an opportunity to watch live judging, look at this 5-minute screen recording of the live stream and listen to the judges commentary. It’s a treasure trove of insights and critiques about what works, how the judges reacted and how it can be improved. The first judge gave it a very high score and did an incredible job speaking to the print. It’s portrait judged in the Family category. One of her favorite qualities about the print is lighting and composition as well as originality. It’s something that she has never seen before, which is one of the qualities of a high scoring print. The total time the judges discussed the image was 15 minutes. I’ve edited the conversation for the sake of brevity. The second judge addresses some of the commentaries from the other judges and provides her counterpoints. One of the topics often discussed in Impact in a photo and rather than just show you a picture and tell you that it has it, her voice shows how much she feels it. Impact resonates and is typically audible. Finally, the first judge sums up the comments and concludes the statements. What tips her over the edge in her scoring is how innovative it is for the Family category. Notice that she is not worried about “that halo around the purple suited gent at the back.” One of the judges we didn’t hear from pointed out that “flaw” as a weakness in the post-production, printing or lighting. The excitement in her voice is tangible, and that’s what we are all hoping. In the end, the print scored a 95 after review. To stop there might miss the best lesson of all. When we first start competing, there are a variety of motivations. Perhaps you’d like to measure yourself against your peers; conceivably you are looking for feedback to grow and get better. There is no greater feeling than the first time you achieve a high score or win your first award. However, there is a fundamental question we must all ask ourselves. Is simply being good enough our goal? Or are you in a relentless pursuit of perfection, regardless of whether you ever achieve it? My father listened to all of the judges comments including the judge who pointed out refinements still needed in the post-production and lighting around one of the family members. He took the critique to heart and reworked the print before entering it in another major overseas print competition. The result? A perfect 100, the first he earned in 40+ years as a professional photographer. If you’d like to see the picture in more detail, head over to our gallery on our website. Print competition is a journey, full of ups and downs. It’s not about what’s you’ve done in the past, and it’s not about what you are doing now. I’m not saying that you have to chase perfection. I am saying that you can make that your goal. I’d remind all of us that no award or accolade is going typically going to turn you into a success. True success is achieved by how hard you work, how deep you love and how much you care for your clients, family and friends. As judges, we want to reward you with as many points as possible. Nevertheless, we also strive to be accurate in our observations. Simply be willing to do the work, submit yourself to the process, listen with an open heart and finally take action. 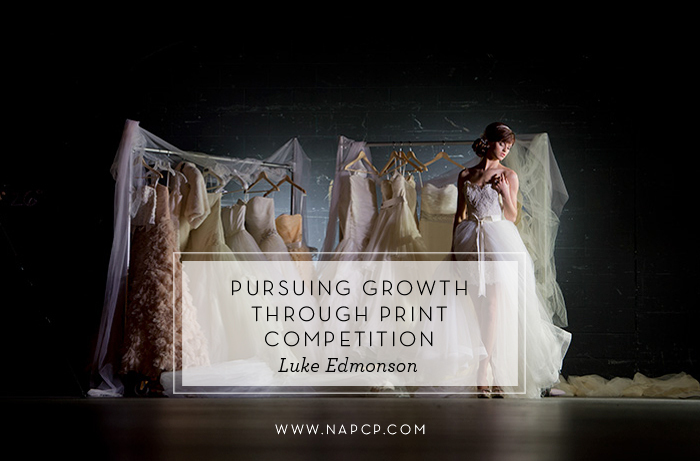 Good luck to everyone in the NAPCP Image Competition! Together with my father David, our business is based in Dallas, TX, and we specialize in the fields of wedding photography, portrait photography and fine art photography. One of our passions is to help aspiring and seasoned photographers become the best they can be and one way we do that is as global speakers, educators, and print competition judges. On a personal level, I’m a limit pusher, family man and, to my wife and daughter’s delight, a purveyor of endless laughter. The 2016 Nikon AIPP Event in Melbourne, Australia from August 27th – 31st, ImagingUSA in San Antonio on January 8th, 2017, SWPP Convention in London from January 13th-15th and WPPI 2017 with the exact dates for programs to be announced. Thank you again for the privilege of being a part of judging your print competition this year and for inviting me to write an article for you. I hope and trust it benefits the members of NAPCP and look forward to seeing the next round of entries and the future growth of all your members!